Carotid Artery Disease is a disease during which a plaque (waxy substance) builds up inside the carotid arteries, which are placed on each side of the neck. Plaques are clumps of cholesterol, calcium, fibrous tissue and other cellular particles that gather at microscopic injury sites within the artery, in a process called atherosclerosis. Over time, plaque hardens and narrows the arteries, which may limit the flow of oxygen-rich blood to your organs and other parts of your body. Each of the carotid arteries divides into internal and external carotid arteries, which have different functions. 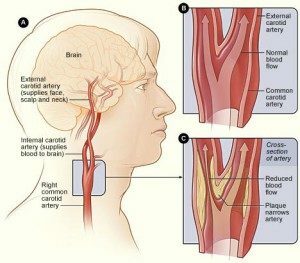 The internal carotid arteries supply oxygen-rich blood to your brain while external carotid arteries supply oxygen-rich blood to your neck, scalp and face. If too much plaque builds up in your carotid artery, artery can crack or rupture. Blood cell fragments called platelets stick to the site of the injury and may clump together to form blood clots, which can fully or partially block the blood flow through the arteries. A piece of plaque or a blood clot also can break away from the wall of the artery and travel through the bloodstream. It can get stuck in one of the brain’s smaller arteries, and block blood flow in the artery causing a stroke. Carotid artery disease develops slowly and may not cause any signs or symptoms. The first sign that you have the condition may be a transient ischemic attack (TIA), which is a temporary shortage of blood flow to your brain. For some people, a stroke is the first sign of the disease. Factors that increase your risk of carotid artery disease include high blood pressure, diabetes, high blood-fat levels, and obesity, lack of exercise and family history. Your risk of carotid artery disease is higher if someone from your family also suffers from atherosclerosis or coronary artery disease. Treatment of carotid artery disease usually involves a combination of lifestyle changes, appropriate medication and sometimes surgery including diet and regular exercise.